When an Ad Campaign Goes Terribly Wrong or Right, Who Wins? As a Weight Watchers fan, both in terms of the product and in terms of Weight Watchers’ marketing strategy, it’s enjoyable to see it get a big win, even if it’s in the form of supporters defending it from a competitor’s surly ad campaign. And since I’m all about competition, and I’m also a big believer in karma, on its face, this week’s Facebook throw down was particularly interesting. But did it also count on brand loyalty to come smack it in the face? Possibly, and, boy, did it. 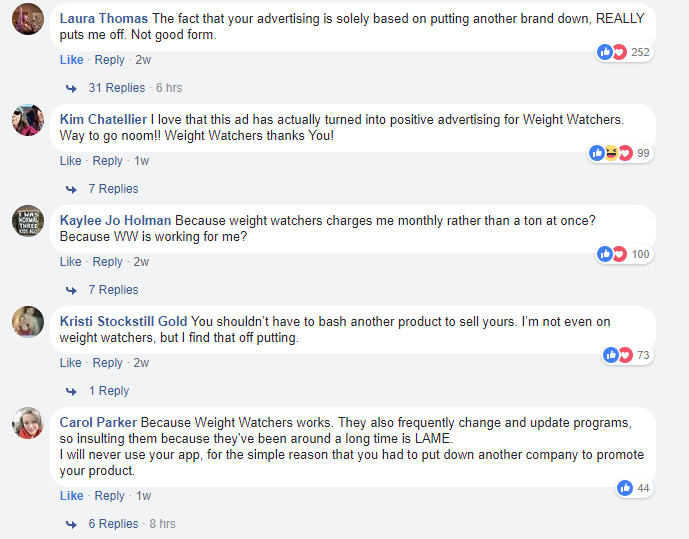 Weight Watchers members reacted with an array of emotions, including disgust, abuse, mockery, and anger at Noom for criticizing the very effective Weight Watchers program. Talk about brand advocates! The responses went on and on (including me saying nice things about Weight Watchers). Of course, there were defenders of Noom in the replies, and then there were replies to the ad that had nothing to do with Weight Watchers or Noom, but the bulk of responses was about how great Weight Watchers is. So consider what Noom marketers must have been thinking. The devious, but super effective, goal here may have been to anger Weight Watchers’ fans. 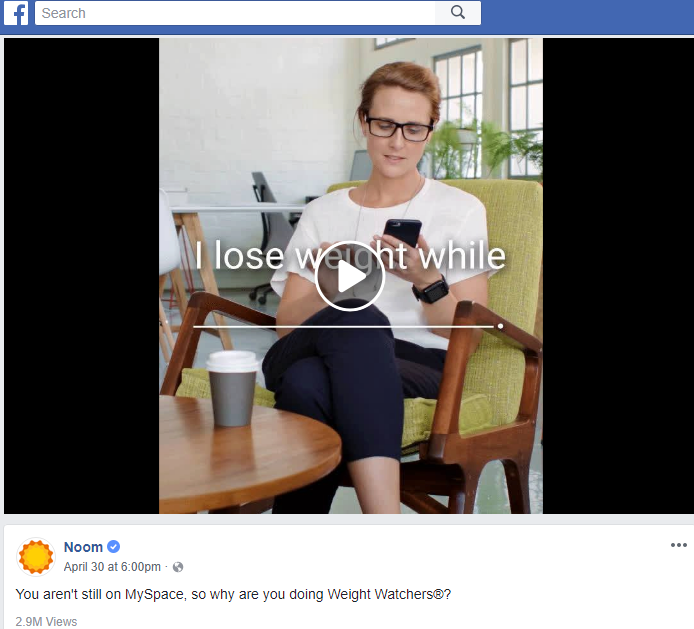 Here me out: As a new product coming onto the market, and actually targeting Millennials (see the young woman in the video still in the ad), Noom couldn’t possibly compete against Weight Watchers on Weight Watchers’ terms. This is asymmetrical warfare at its finest, and while I’ll never try Noom (probably because it’s moon spelled backward but its logo is a sun, and that’s just not right, or because I’m not a Millennial), I scrolled on and on through its ad replies, and here I am writing about it. And the video, as you can see, has hit nearly 3 million views at the time of this writing, so do we call this a win or a fail? If the goal was to target Millennials, maybe a fail, particularly since this was on Facebook, which is most popular among women of a certain age! If its goal was to get people talking about Weight Watchers on its ad, then oof, big fail. But if Noom’s goal was to get people to become more aware of its brand and what Noom is and does, then I consider this strategy a potential win, on the condition that it has great follow-up tactics for winning over those who don’t want to try Weight Watchers or don’t like Weight Watchers (because they are not women of a certain age!). Thinking this kind of strategy against a bigger competitor could work for you or your business? I’d love to hear your thoughts.